Formerly known as Titanium: This is a gorgeous holo silver from their 5 piece glitter collection. You can purchase it as part of a set or individually. This is 3 thin coats. Formerly known as Shine Star: Another of their gorgeous glitters is this gold! Again, this can be purchased individually or as part of the glitter set. Now for some Spring shades. Yes, I know I missed Spring but the 7 piece Collection is still available for £32.99! You can also buy these individually. Formerly known as Rose Bud: A gorgeous rosy-pink! As the name suggests. This is 3 thin coats (I prefer to do thinner coats with gels – you could get away with 2 if you wanted). Formerly known as Salmon Run: Again this is aptly named. I love this peachy-salmon colour and is gorgeous for spring and summer. 3 thin coats. Formerly known as Mint Convertible: I am in LOVE with this pretty pastel mint green! I’ve worn this a couple of times already. This is 3 thin coats. Formerly known as Cake Pop: A lovely bubblegum pink and a perfect addition to the spring collection. 3 thin coats. And now we move onto the Summer Holiday Collection! You can buy the next 5 colours as part of a set for £19.99 or individually. This is a personal favourite of mine. If you’ve read any of my blog posts before, you’ll know I love a good blue and this one is GREAT. It’s just a shame it’s a little on the sheer side, this is 3 coats and you can still see my smile lines. This stunning sunshine-lemon yellow has a pretty little shimmer to it and it’s limited edition so I would grab it while you can! 3 thin coats. I bright and fun orange, perfect for summer! Although, I’ll be dragging this into autumn – this is calling a Halloween mani. 3 thin coats. A brilliant blood-orange/red! This is honestly so stunning in real life. 3 thin coats, again. At first, I thought this was similar to Baby Girl but it has a more blue undertone and is definitely still giving me bubblegum vibes! 3 thin coats. And now we have some individual polishes that I chose for the up-and-coming autumn months! Formerly known as Decadence: Although this looks like a true-blood red, it actually has more pink undertones in real life. This took just 2 coats. Formerly known as Black Pool: A standard classic black! Unlike black gels I’ve tried before this could definitely be a one-coater if you’re careful! I’ve done 2 thinner coats here to be sure. A gorgeous shimmery burgundy red. Can’t wait to wear this one next! 2 coats. As you might be able to guess, I think this is STUNNING! Look at those little sparkly flakies swimming in that deep navy! 2 coats. And there we have it! 3 seasons in one blog post. I hope you liked seeing all of these polishes. I honestly love all of the colours and the formulas are easy to work with too. 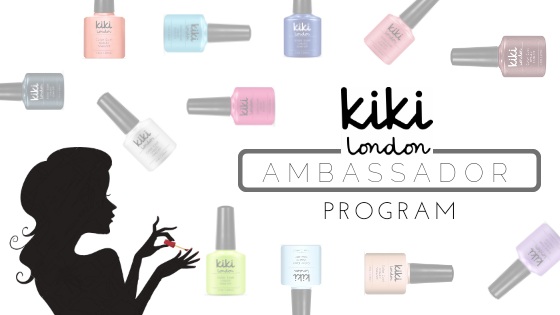 I recommend you check out my previous swatches for Kiki London and that you hop on over to their website to make a purchase! Don’t forget to use my discount code TIPPEDOFFNAILS for 15% off everything.